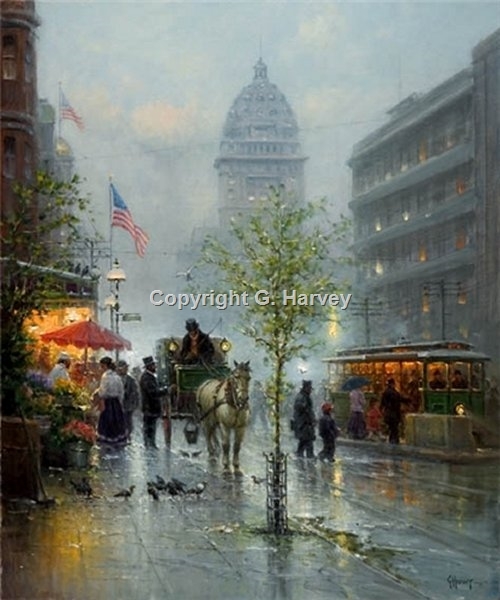 Market Street Trolleys - San Francisco by G. Harvey ~ This lovely piece shows streetcars along Market Street in San Francisco around the turn-of-the-century just prior to the big earthquake of 1906. The tall building in the background is the "Call Building" which stood through the earthquake when most in the area were destroyed. The city of San Francisco has dedicated itself to refurbishing the streetcar lines. The line that now runs along Market Street is called the "F line". The city has purchased antique streetcars from cities all across the country and is refurbishing them completely right down to the fabrics that were used on the seats. Perhaps the most famous of the streetcars is "The Streetcar Named Desire" which has been purchased from the city of New Orleans. A ride on the "F line", like this beautiful painting, will surely take one back a hundred years or more.